Explore Canada’s East Coast in ‘Expedition 2018: Exploring the Trans Labrador Highway‘ where two couples head out for a 14-day journey along one of the most iconic routes in Canada. Or learn ways to include the family on 4x4 adventures in ‘A ‘Little’ Perspective Overland & Trail Tips for Taking Your Kids’. 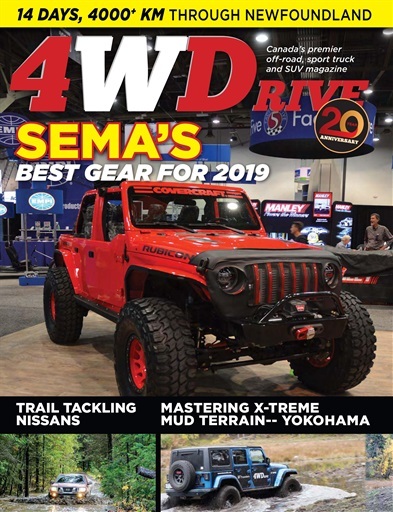 Every year, our editor is recognized as a judge for the SEMA Show Global Media Awards. New essential trail and overland gear premiered at this years show and we examine our top 10 favourite products. Prepare for multi day trips with our field tested favourite gear from sleeping bags, to 4x4 shelters to ‘instant kitchen’ cook stations. Truck manufacturers are busy releasing new products for 2019, but what makes one mid-size pickup-up better than the next? We share our top tips for choosing your new truck – find one that works for you, without focusing on just specs or brand loyalty.